Former Grand Slam champion Steffi Graf has showered praise on world number one Serena Williams after she equalled the German's long-standing Open Era record of 22 Grand Slam titles at Wimbledon 2016. 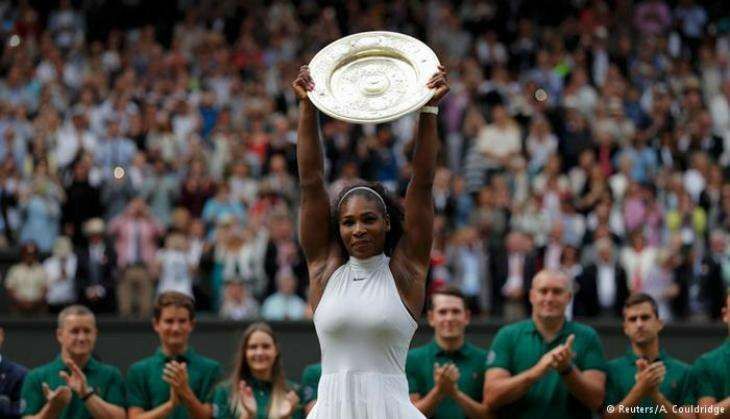 Serena lifted her seventh Wimbledon title with a 7-5, 6-3 win over reigning Australian Open champion Angelique Kerber at the All England Club on 9 July. Describing Serena's performance as 'incredible', Graf said that it was amazing to watch the top-ranked player adding another feather in her cap, Sport24 reported. However, the 47-year-old also praised her countrywomen Kerber for making Germany proud with her talent and fighting spirit. "What an incredible performance by Serena at Wimbledon! Such a gift to all sport fans who get to continue to watch her add to an already amazing career #22!!! Also, well done to Angelique making Germany so proud with her talent and fighting spirit! ," Graf wrote on her Facebook page. Meanwhile, men's world number one Novak Djokovic, who saw his title defence end in a shocking third-round defeat to Sam Querrey, also congratulated Serena for winning the major title.Taking to Twitter, the Serbian wrote, "@serenawilliams loves being 22. So young and successful. Well done Rena!" Djokovic. It was a double delight for Serena at Wimbledon 2016 as she did not only win the women's singles title, but had also notched up the women's doubles crown alongside her elder sister Venus Williams.